ONE LONELY NIGHT, recorded in Hamburg in October 1968 and released at that time in America under the title WARM AND WONDERFUL, is now being released for the very first time on compact disc. Melodies chosen with great care and frequently played in their day by American radio stations are presented here in an elegant, swinging “continental style” by Bert Kaempfert and his Orchestra. The soloists are Werner Gutterer on the trumpet and Herb Geller on the flute. 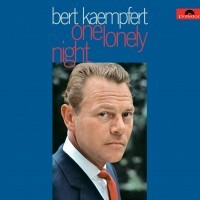 The six original compositions by Bert Kaempfert and Herbert Rehbein range from dreamy, tranquil numbers such as Only In Your Arms and Our Street Of Love to the swinging Petula and the snappy, Spanish-sounding Maltese Melody, a work which also inspired Herb Alpert And His Tijuana Brass to enter the recording studio and which brought him great success. The remaining titles are all old favorites and top hits in their day. Frequently heard in films, I May Be Wrong was originally composed for the revue entitled “John Murray Anderson’s Almanac” of 1929 and constituted the only really great success of its writers, Henry Sullivan and Harry Ruskin. Some Of These Days, composed as early as 1910 by Shelton Brooks, gave the career of American singer and actress Sophie Tucker a tremendous boost: the song became her signature tune and gave her autobiography its title. One Morning In May was composed in 1934 by the great American songwriter Hoagy Carmichael; it was one of his personal favorites and became famous through recordings by Tommy Dorsey and Sarah Vaughan to mention a few. Can’t Take My Eyes Off You, from 1967, fetched the singer Frankie Valli a gold disc and also proved a great success for The Lettermen and Nancy Wilson. A gold disc was also awarded to Herb Alpert And His Tijuana Brass for his recording of This Guy’s In Love With You, composed in 1968, one of the greatest hits ever to have been written during the Sixties by what is probably America’s most successful songwriting duo, of Burt Bacharach and Hal David; it was a top-ten hit for Bacharach’s favorite performing artist Dionne Warwick.